Are you sure that your product’s user experience (UX) is where it needs to be? If you’re relying strictly on statistics such as your previous year’s sales numbers, you’re missing the bigger picture. Sure, raw sales data is a strong indication that customers are (or are not) interested. But taken alone, it doesn’t give any insight into how customers feel about your product’s experience. So how should you find out what your customers really think? Before embarking on your product’s UX update, check out our handy 5 step guide. 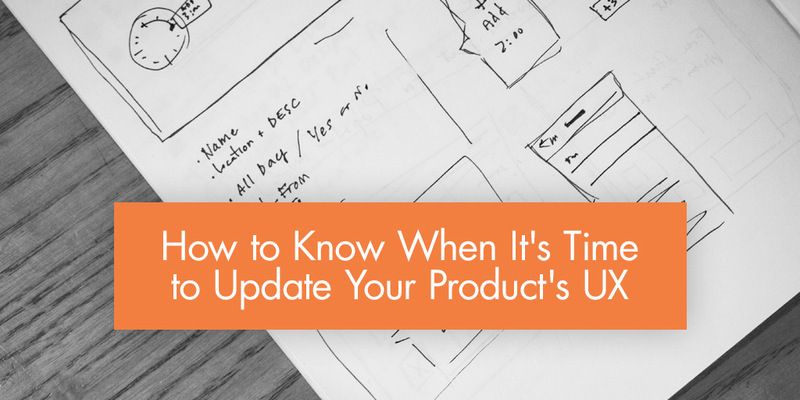 Before embarking on your product’s UX update, check out our handy 5 step guide. Subscribe to receive this free resource. To really understand your customers, you need to speak with your employees who are on the front lines. Customer-facing employees, such as members of your sales team or customer service support staff, offer valuable insight into how customers feel about your product’s experience. Instead of focusing solely on sales numbers, it’s important to meet with your teams on a regular basis to review the customer feedback that’s coming in. To be clear, you’re not looking for only the flowery “five star” customer feedback. You’re looking for honest feedback — both good and bad — that shares as many details and specifics as possible. Make sure your teams know that these feedback reviews are meant to give everyone an idea of what the company needs to be doing to improve the customer experience. From a service standpoint, customer complaints are usually not seen as a good thing. But in truth, they offer valuable insight into how customers are interacting with your product. Encourage your teams (and yourself) to review and analyze customer complaints on a regular basis. Are there noticeable trends related to one specific area of your product’s experience? Do you see issues with multiple touch points? These are good indications that there’s room for improvement. You’ll need to set up a feedback and suggestion box for your customers too. This is different from capturing complaints, since most ;complaints focus on what’s wrong. With a suggestion box, you’ll receive constructive feedback on how to improve your product’s experience. Many times, you’ll find suggestions to update certain aspects of your business that you didn’t even realize needed improvement. A digital suggestion box on your website or in the footer of customer-facing emails is a great way to capture this type of feedback. The more accessible you make opportunities to offer feedback, the more likely your customers will provide it. Your suggestion box needs to be simple and must contain one box that allows customers to write as much as possible (essentially, an unlimited character count). If you throw in additional questions for your customers to fill out, they won’t bother leaving a suggestion. Compile this information, along with the feedback and complaints from your sales and customer service employees, and go over it as a team. Together, you’ll need to address how to improve things. Although suggestion boxes are a great way to capture your customers’ feedback, not everyone is going to fill one out. The best way to combat this issue is to ask your customer directly for their opinion during one-on-one interviews. After all, that’s the most direct way to find out what they really think of your product. Gather a handful of your customers (a healthy mix of both current, previous, and prospective ones) and conduct individual interviews via Skype, by phone, or in person. Before you begin your interviews, spend time coming up with the right questions so you don’t unknowingly coerce your customers to answer in a certain way. Remember: you need the most honest feedback possible. If you end up using leading questions, you’ll be wasting both your time and your customer’s. To keep your questions neutral, stick to open ended questions instead of yes/no or multiple choice options. This gives your customer the opportunity to open up and discuss their thoughts and feelings. Unlike surveys and suggestion boxes, your customers won’t have to spend time writing down a lengthy response, which actually makes them more likely to elaborate. Plus, most customers will appreciate that you want to hear their feedback. And whenever you’re interviewing your customers, it’s also a good idea to record the conversations so that you and your team can refer to them at any time. Moving forward, the next time you need to take an important step with your business — especially one that’s connected to your product’s experience — this feedback will help inform your decisions. No matter which method you choose to gather your customers’ feedback, it’s important that you genuinely listen to their responses. Remember, you’re not looking for customers to only validate the ideas that you already have. You’re looking for fresh perspective and honest feedback that will help you improve your product’s UX. It’s essential that you stress this point with your team, especially when dealing with customer complaints. It’s human nature to take a complaint to heart instead of analyzing the problem at hand, so encourage your team to review all feedback objectively. It’s human nature to take a complaint to heart instead of analyzing the problem at hand. Over time, as you gather more and more feedback, you’ll be able to make important decisions more quickly, and you’ll understand your customers more completely. In turn, once your customers see that you genuinely listen to them, they’ll be more likely to engage with your company long into the future. Before embarking on your product’s UX update, download our handy 5 step guide.